Now 27 years ago in 1983 some of us weren’t even born, and those of us who had been were still young children or in our teen years. Arcades were all of the rage still around the world and one game arrived that took these Arcades by storm. That game was Dragon’s Lair. Despite the popularity of games out in the arcades at the time, none could not hold a candle to the uniqueness that was Dragon’s Lair. Arcade-goers had no idea what to expect when they first began playing a game that was so unlike anything they had played before. As the months wore on it grew harder and harder to simply find a working cabinet of Dragon’s Lair due to its immense popularity causing the cabinet to malfunction. Now that was many years ago and now that Dragon’s Lair has revived itself on the PSN does it still have that same old school goodness so many loved? As far as the story goes there isn’t much structure for Dragon’s Lair. You take the roll of Dirk the Daring, a knight who is in love with the Princess Daphne. But of course it wouldn’t be called Dragon’s Lair if there wasn’t a dragon involved. The dragon Singe has kidnapped Daphne and is holding her within his trap filled castle and it is up to Dirk to save her. Sure the storyline isn’t much to go on, but it does establish one of the earliest video game premises about a hero saving a princess. Also it helps that as you progress through the castle the different routes end up changing and can become completely maze like at times. While the storyline does set the stage for the game itself, there isn’t much development beyond the initial premise and then of course saving Princess Daphne. Now back in 1983, you can count the amount of pixels that were used in most heroes on one hand, two hands if you were lucky. 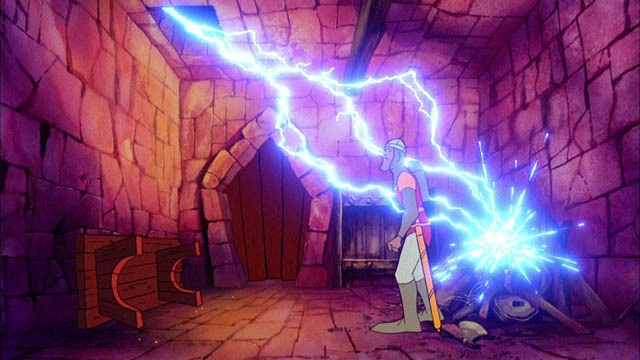 But what set Dragon’s Lair apart was the fact that it was a fully animated and beautifully drawn game. This literally stunned audiences when it first appeared for public use and was many years ahead of its time graphically. Now these graphics have been revamped to look even more stunning on HD screens. The art that fans had come to love returns better than it had before with animation work rivaling top cartoon companies of this era. Of course the reason for this was that Don Bluth, an ex-cartoonist from Disney, created the animation and handled all of the drawing and his expertise is clearly evident throughout the entire game. Newcomers to the series will especially love the great look of the game and can easily have their children play as well thanks to the appealing nature of the cartoon graphics. Also there are two modes of gameplay display. Fans of the original arcade game can take advantage of an arcade mode setting that places the screen within an arcade cabinet and certainly gives it that old time feel. Though if you prefer the more modern wide screen versions then that is originally the standard setting. 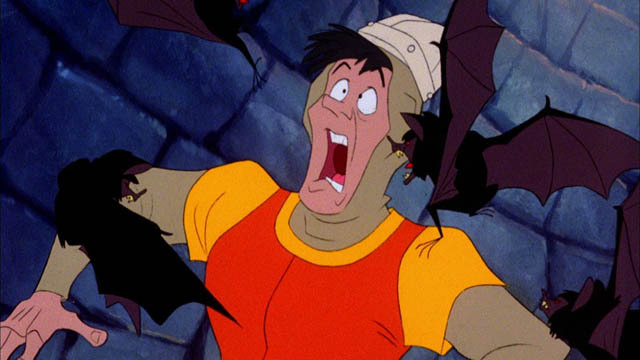 Now the best way to describe Dragon’s Lair’s gameplay is as a series of quick time events. Being a full motion video game like it is, the majority of the actual gameplay is only pressing a directional button or X if you have to swing your sword. The on-screen D-Pad will highlight what button to push at the right time to avoid death, or the center of the D-Pad will highlight to show that Dirk has to use his sword to avoid death. Now death is something that happens quite often in Dragon’s Lair as any missed or mis-pressed action will result in Dirk’s instant death. Now the ways that Dirk dies are as humorous as they are numerous and one of the more interesting aspects is the fact that you can simply fail on purpose to see what happens to Dirk in that situation (not that you won’t be dying enough already). When Dirk dies he will resurrect from his skeletal form ready for battle again, that is of course unless you are out of lives. Then he just is a zombie that crumbles into dust before a Game Over screen. These can be avoided however as players have the option to set either 3, 5, or infinite lives which makes it quite easy to make your way through the game if you wish it, or provide yourself a little challenge. Initially players will find themselves frustrated at the difficulty of the quick time events, as many require extremely fast reactions to avoid death. However whatever doesn’t kill you (or end the game) makes you stronger. In the Home version of the game, death will result in Dirk respawning in the same exact room and allows the player as many tries as they have lives to make their way through. The Arcade mode will place the player in another part of the castle entirely. The gameplay itself is quite humorous as I stated earlier thanks to the fact that Dirk, even though a knight, appears to be a complete coward in some situations. He can quickly flip flop from a daring fighter to running in terror and shrieking from the current traps he encounters. However if you happen to be having trouble with the game itself, then you can choose to simply watch the game. Yep this port of the game has a feature that allows players to watch the game be played flawlessly from start to finish. This means that if you are currently lost within the castle, or are just dying to save the princess then you can watch it happen. Then again this also shows how short the game can be if played through flawlessly. 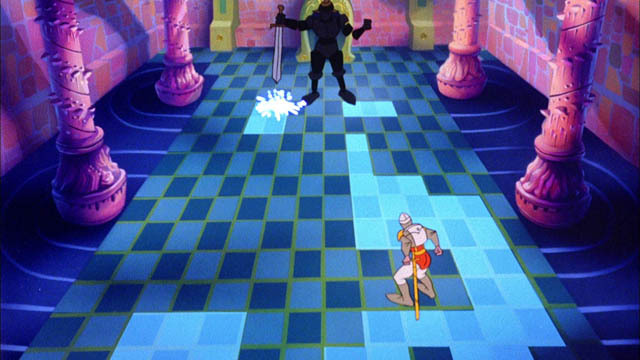 Dragon’s Lair can be completed easily within one sitting if you know exactly what to do in each room, but even then a quick death to not pressing the right button fast enough can set the player off on a different path entirely. So while the game itself may be short, the replay value is quite high due to the amount of different paths that Dirk can take on his quest. Dragon’s Lair is perhaps just as iconic as Pac-Man as far as old arcade games go. It was truly a sight to behold nearly thirty years ago and it still hasn’t lost its appeal now. Though overall the actual gameplay aspect may be a series of quicktime events, it doesn’t mean anything when placed against the ever changing environment and pure nostalgia factor that Dragon’s Lair provides.